Jane Siberry is often dismissed as a poor Canadian version of Kate Bush. This is unfair, for while Siberry was undoubtedly influenced by Bush, she has a very distinct voice  she's less angry than Bush and seems more concerned with constructing narcotic melodies than in the punctuating din of dissonance that characterizes much of Bush's work. 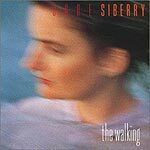 As on earlier albums, "The Walking," Siberry's fourth album, is full of exotically charming melodies carried by Siberry's high, thin voice. But "The Walking" shows yet another leap ahead in her artistic growth. Siberry is less dependent here on the intoxicating rhythms of her previous recordings and displays enough confidence in her voice to weave lengthy passages a capella. Siberry also features a more traditional instrumentation here. Earlier works were heavily built around synthesized sounds, and while the electronic component is still present, more acoustic (and traditional electric) guitars are used, giving "The Walking" a leaner, less polished and more appealing sound.